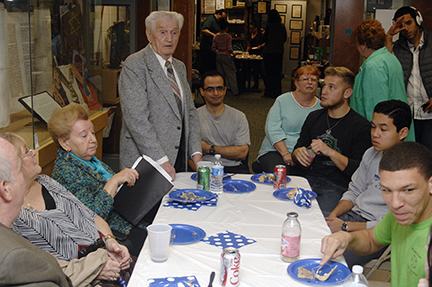 WEST WINDSOR – With vivid memories of the Warsaw ghettos to the Auschwitz death camp, local Holocaust survivors shared their experiences with a group of Mercer County Community College (MCCC) history students who had the opportunity to hear first-hand accounts of the tragedy of the Holocaust. 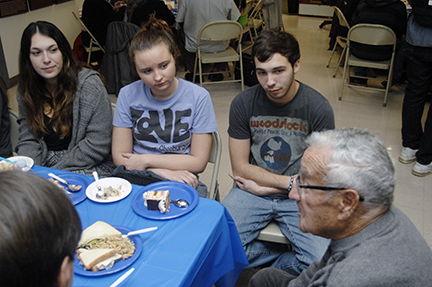 The Mercer County Holocaust-Genocide Resource Center (MCHGRC) hosted a survivor’s luncheon on Nov. 19, where four area residents who personally experienced the horror of the Nazi occupation of Europe recounted their experiences. Their stories ranged from enduring years of forced labor in concentration camps to escapes in the dark of night under threat of immediate execution, and even a soldier who stormed the beach at Normandy to begin the liberation. Zaifman recalled how he would be in a line with other prisoners, with Josef Mengele – the sadistic death camp physician – standing at the front of the line. He would point his thumb either left or right. One direction you live, the other you die. Zaifman said prisoners would be handed a bar of soap, presumably to take a shower, when in reality, they were being sent to a gas chamber. He personally was forced to serve on a squad that collected bodies for the crematorium. “The agony of the whole thing was unimaginable,” he said. Zaifman survived Auschwitz only to be sent to another notorious Nazi death camp: Dachau. Sydney Weinstein had a different perspective on the Nazi occupation of Europe. As a solider in the United States military, he was among the thousands who stormed the beaches of Normandy during the D-Day invasion, and liberated many villages as the Allies pushed across France and into Germany. But many soldiers never made it to shore, cut down by a hail of machine gun fire. Dr. Vera Goodkin, MCCC Professor Emeritus and member of the MCHGRC Advisory Commission, was rescued during the Holocaust by Swedish diplomat Raoul Wallenberg, who helped her and her family escape from Nazi-occupied Czechoslovakia to Hungary through muddy fields on a cold rainy night. Coenen noted that the stories of Holocaust survivors, each of which is unique, carry common themes: perseverance, a will to live, and good fortune. 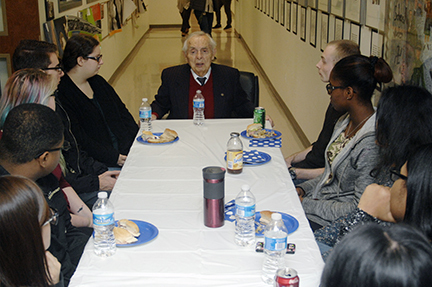 Holocaust survivor Henry Eisenberg (standing) recalls his years in forced labor camps as a teenager in Poland. Sydney Weinstein (right) tells students what it was like as an American Soldier in World War II as part of the Normandy invasion that liberated Europe from Nazi occupation. Jack Zaifman (head of table) recounts his experiences as a prisoner in the notorious Auschwitz and Dachau concentration camps during the Holocaust. Students in the HRIM/Culinary programs and the MCCC Hospitality Club prepared a cake for the Holocaust Center's survivor's luncheon. 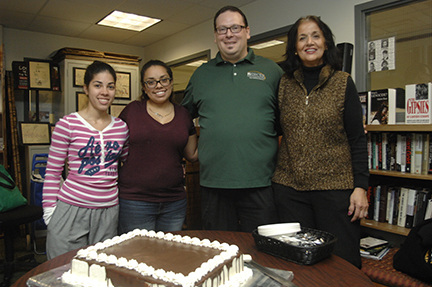 Pictured are students Kim Arroyo and Andrea Rivera, with MCCC Culinary instructor Chef Frank Benowitz and Holocaust-Genocide Resource Center Co-Director Elizabeth DeGiorgio.